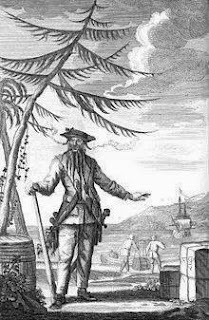 The wicked pirate Blackbeard, who in real life was Edward Teach, was a tall man with a very long black beard that hid most of his face and extended down to his waist. He is often associated with the meanest of the Pirates in history and one of merciless to have wrecked havoc on the brave seafarers during The Golden Age of Pirates. Blackbeard tied his beard up in pigtails adorned with black ribbons. He wore a bandolier over his shoulders with three braces of pistols and was reported to hang two slow-burning cannon fuses from his fur cap that wreathed his head in black smoke. Occasionally, he would set fire to his rum using gunpowder, and he would drink it, flames and all. Others claimed he would fight with matches lit in his beard to strike fear in the heart of his enemies. It would be hard not to believe as many did, Blackbeard was the Devil incarnate. Blackbeard was a master of intimidation. With fire in his eyes; a brace of pistols, daggers, and a cutlass at his side; slow burning fuses protruding from under his tri-cornered hat; and his thick black beard was often tangled and decorated with red ribbons. It is said that Teach sent most merchant captains scurrying to raise the white flag at the mere sight of him. About 250 years ago, this gruesome figure had his head chopped off near a place called “The Point” known today as “Teach’s Hole.” It is here he would seek anchorage in his later years! Edward Teach was killed by Lt. Robert Maynard of the British Royal Navy when his vessel The HMS Ranger and HMS Jane engaged The Adventure captained by Blackbeard near Teach’s Hole. Blackbeard had retired from Piracy having agreed to a pardon by swearing allegiance to the crown. However, the Governor of Virginia, Alexander Spotswood, was not assuaged. He wanted Blackbeard gone for good and sent Maynard for the job. When they came upon Blackbeard's Adventure, they were hit with a devastating broadside attack. Midshipman Hyde, captain of the smaller HMS Jane, was killed along with six other men. Ten men were also wounded in the surprise attack. The sloop fell astern and was little help in the following action. Maynard continued his pursuit in HMS Ranger, managing to blast the Adventure's rigging, forcing it ashore. Maynard ordered many of his crew into the holds and readied to be boarded. As his ship approached, Blackbeard saw the mostly empty decks, assumed it was safe to board, and did so with ten men, climb aboard The Ranger. Maynard emerged with his men and engaged Teach in a bloody fight to the death.Blackbeard fought hard. However, he died from blood loss from suffering so many wounds in close quarters combat with Maynard. He was reportedly loading his pistol when he finally keeled out and collapsed on the deck. In death, his grisly head continued to inspire dread. Hung from the bowsprit of Maynard’s vessel, Blackbeard’s head was carried to various ports in eastern North Carolina. Ultimately, it was impaled on a stake at the entrance to the harbor in Hampton, Virginia as a warning to other “Brethren of the Coast” that rule of law had returned to the Outer Banks and the days of Piracy were ending. It gets better. Before sailing from Ocracoke Inlet, Lt. Maynard tossed Blackbeard’s body over the side of his ship into dark murky water. Legend has it that the remainder of the pirate crew, now shackled and bound for trial, watched in awe as the headless body of their captain, perhaps in one last act of devilish defiance, swam three times around the vessel before sinking silently below the surface to the depths of the water. Blackbeard's ghost is said to haunt the land near where he was killed. Islanders that are brave and foolhardy enough to venture out to the Point after dark have routinely reported encountering the ghost of Blackbeard himself, pacing along the shoreline, lost in agony, presumably looking for missing head.